Deep well hand pumps are used in wells up to 80 meters deep. At that depth lifting the weight of the column of water requires some form of mechanical advantage. The India Mark III and Afridev hand pumps both have extendable pump handles which provide additional lift at greater depths. Also, deep well hand pumps need to be built with stronger and sturdier components to stand up to the extra stress associated with lifting a larger column of water. The installation, maintenance and repair of deep well hand pumps can be more complicated than with other hand pumps, but some deep well hand pumps are designed for ease of maintenance at the village level. The India Mark III hand pump and the Afridev hand pump may be purchased in a deep well configuration with components suitable for lifting the additional weight of a larger column of water. The Afridev hand pump was designed and developed in Malawi in the early 80’s and later in Kenya. From the beginning the goal was to develop a pump that was easy to install and maintain at the village level. Developers of the pump also wanted a reliable hand water pump that could be manufactured in-country using available resources. The original ball bearing design of the rod hanger assembly and the pump lever fulcrum proved to be unreliable over the long run. Designers eventually settled on a simpler and more dependable plastic bushing design for the rod hanger and fulcrum in the pump head. Plastics research and development played an important role in the final design, providing an inexpensive and durable alternative to ball bearings. The Afridev hand pump is a conventional lever action piston pump. It is of the open top cylinder design, allowing the pump piston, foot valve, and pump rod to be removed for maintenance without pulling the riser main. The pump cylinder is 50mm (2 inches) inside diameter and is brass lined. A stainless steel-lined cylinder is available for corrosive water situations. 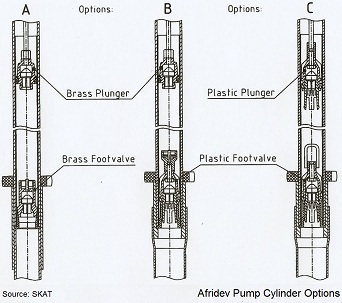 In the Afridev design a separate “fishing” tool is used to pull the foot valve. The piston valve and the foot valve are of identical design, allowing the valves themselves (not the housings they are in) to be interchangeable. This helps to reduce the cost of manufacturing and maintenance. Afridev riser main is made of 65 mm (2 ½ inch) PVC pipe. The pump rod is stainless steel with a hook and eye connection making it easy to connect and disconnect pump rod sections without tools. High quality plastics are used for the piston valve and foot valve and for rod hanger and fulcrum bushings. Above-ground parts of the Afridev are galvanized steel and may be locally manufactured. The pump handle can be extended to assist in water lifting in the case of changing water levels. Since the Afridev is an open-cylinder configuration and is therefore amenable to village level operation and maintenance (VLOM). Afridev pumps are easy to install and maintain and require no heavy-lifting tools such as C-wrenches or tripod with block and tackle. The standard Afridev pump is designed to operate at a depth no greater than 45 meters (150 feet). Afridev hand pumps can also be configured as deep well hand pumps utilizing a brass piston valve and foot valve and larger piston seals (or two seals)to cope with the added forces of the deep well application. With the addition of a bottom-supported riser main, the effective depth of Afridev deep well hand pumps can be extended to 80 meters (260 feet). The bottom of the piston assembly in Afridev deep well hand pumps is threaded so that it can be screwed onto the foot valve for foot valve retrieval during maintenance. Afridev deep well hand pumps usually have an identifying tag on the pump base indicating that it is a deep well version of the pump. 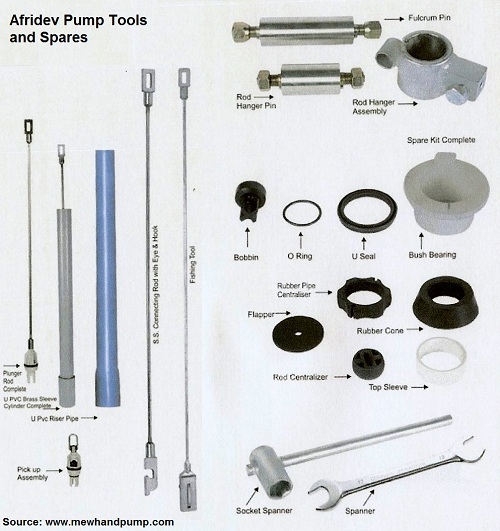 Below you will find a tools and spare parts that are commonly used for maintenance on Afridev hand pumps and deep well hand pumps. There are very few tools required to perform maintenance on an Afridev pump. With just the socket spanner and box-end wrenches (16mm-24mm) and the fishing tool a local mechanic can completely disassemble the pump head and remove the pump rod, piston valve and foot valve. As mentioned earlier, the Afridev was designed from its inception to be a VLOM pump. Designers purposely engineered a pump that would require only minimum of tools, minimum training, and readily available parts. This differs from the evolution of the India Mark III pump which arose out of the earlier Mark II. The tools required for maintenance of the India Mark II pump are much more extensive, specialized and bulky. These then became the same tools (with a couple of exceptions) that were used in the maintenance of the Mark III pump. The Afridev pump is therefore easier to work on than the India Mark II pump and even the Mark III pump. It was designed with simplicity in mind. 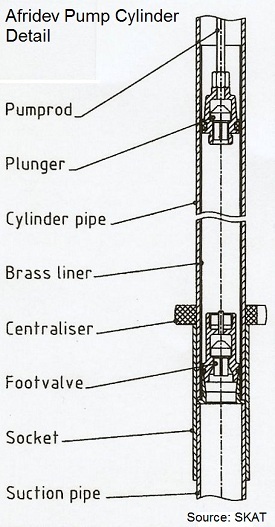 In the figure, the foot valve (shown in the picture as the pick-up assembly) fits into the pump cylinder first, using the fishing tool, and gently pressed into position in a groove at the bottom of the cylinder. 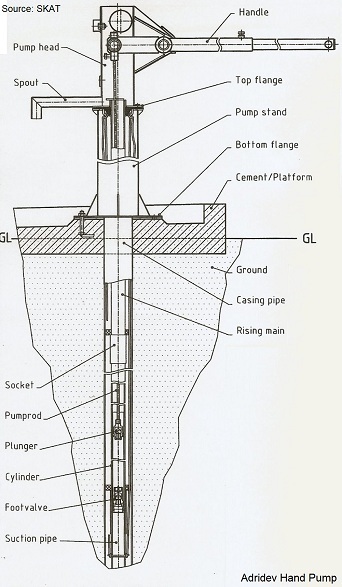 The plunger rod is the last section of pump rod with the piston valve attached to the end. It is the first section of pump rod to go down the well and it fits inside the PVC Brass Sleeve Cylinder. This is the Afridev open-top cylinder. PVC riser main fits on top of the cylinder. Subsequent sections of pump rod attach together with a hook and eye configuration. The hook can be seen on the S.S connecting rod (pump rod). Also shown in the picture are various spare parts that are commonly used for repairs either in the pump head or in the pump cylinder. At the bottom of the figure you will see the only other tools you will need to work on the Afridev pump; the socket spanner (a multipurpose tool) and a spanner or box-end wrench. A manual for the Afridev hand pump has been published by the Swiss Centre for Development Cooperation in Technology and Management (SKAT). A pdf version of that manual can be downloaded here. SKAT also publishes a Maintenance Card that is an easy-to-follow summary of pump disassembly, inspection, replacement of worn parts, and reassembly. You can print out a pdf version of the maintenance card here. Return to "Introduction to Hand Pumps" from "Deep Well Hand Pumps"